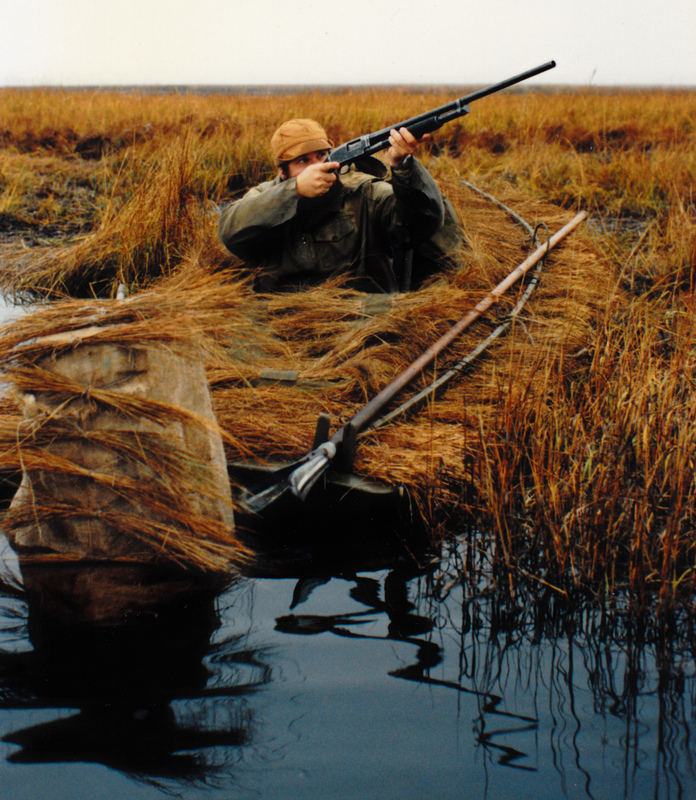 It has been my observation that do-it-yourself duck hunters are usually fairly skilled scroungers – perhaps “scavengers” is more polite. In order to make a dollar go a long way – or just to avoid the pain of actually spending one – scroungers/scavengers are adept at finding and “re-purposing” all manner of stuff that may not, at first glance, appear to have much value. Usually the stuff found through scrounging would be categorized as “Materials & Supplies” – the things you need to fabricate something from scratch. Thusly do wheel weights become decoy anchors and mop handles become pickup sticks. Sometimes, though, one stumbles across a find that would be more properly construed as “Equipment” – or perhaps “Durable Goods” – something in the nature of “the whole enchilada”. Such was the case when the U-boat Commander and I came across “Uncle Joe’s Sneakbox”. We were in the midst of “protecting freshwater wetlands for the People of the State of New York “. More specifically, we were conducting site inspections on the south shore of Long Island and were finding our way to the next location where someone was proposing to build something in or near a swamp or marsh or creek. Whether by dint of superior age, longer practice or – certainly not! – pulling rank, I spotted this “seen-better-years” vessel just a long moment before my partner. I do not recall if I actually hollered “I got it! – an instinct ingrained from the sandlot ball of my youth – but I clearly recall first seeing the unmistakable shape of a ‘glass Sneakbox right beside a dumpster at an auto body shop. We scheduled an ad hoc break – I believe our attorneys would refer to such behavior as “frolic and detour” – and pulled in next to the very same dumpster. A brief exchange with the proprietors – after assuring them that we were not there on official business – revealed that the craft was the property – most likely abandoned – of Uncle Joe. I was given Uncle Joe’s home phone and so the U-boat Commander and I returned to our appointed duties. A phone call that evening transferred the boat to me for its fair market value of $ 0 – it was pretty busted up – and I hauled my empty trailer down there the very next day. With some ‘glass and resin and plywood, I repaired a few major breaks in the hull, refastened the deck to the hull in several places and then set to work fitting her out for more days on the marsh. I built and installed floorboards, shelves, the motorboard, thatch rails and oarlock stanchions. I then sewed up a spray dodger, a cockpit cover (for storage and transport) and a lap cover (for gunning). 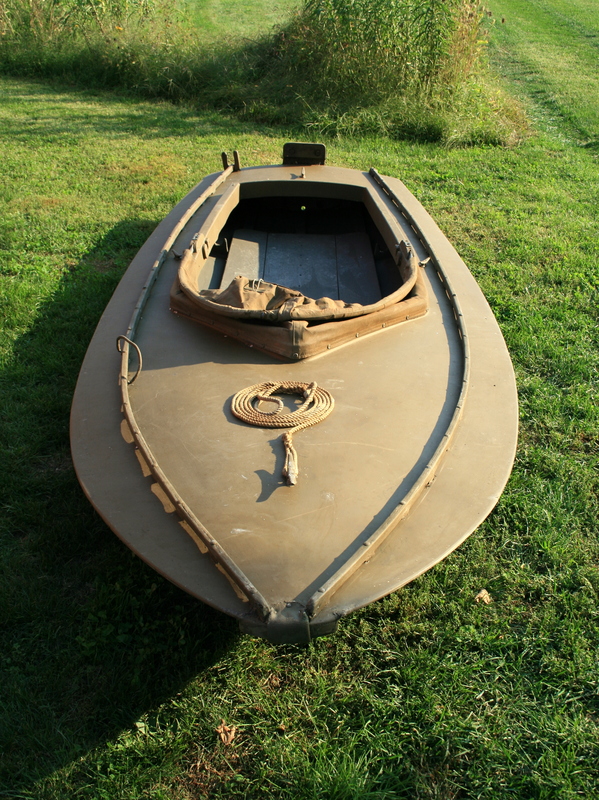 Finally, I poured plenty of 2-part urethane foam into the bow. These pictures show her as I gunned her for several years before I moved from Long Island in 1995. 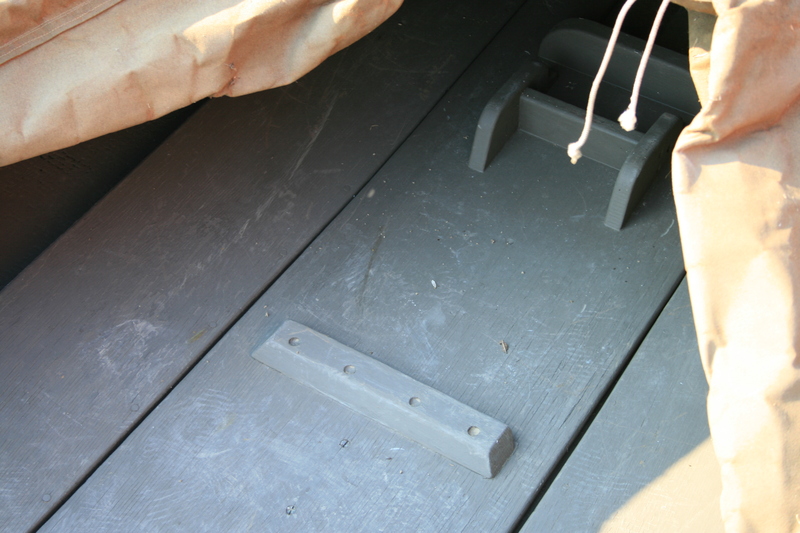 The cleat on the floorboard keeps the backrest in place and the forward chocks hold a 10-pound Navy anchor – it is lashed there with 50 feet of half-inch nylon rode for emergency anchoring only. There are 3 plywood floorboards. The middle one is screwed – and set in 3M 5200 – permanently to the center stringer. The outer ‘boards are removable. They fit under the middle ‘board with a full-length wooden flange and are held in place with a single White Oak turnbutton apiece. 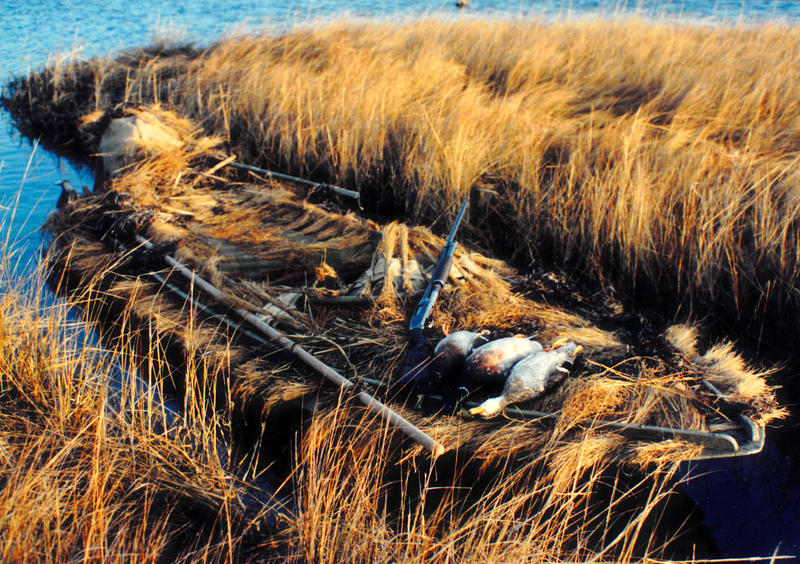 These photos also show the shelf, the racks to store the oars, and the chock – fastened to the inside of the coaming – to hold the “lap canvas” – a thatched cover to hide your legs and chest while laying in wait. The motorboard has been replaced since I shot this photo. The chocks aft and “bail” forward on the starboard side – because I am right-handed – hold my pushpole when under way. Here is the new (2012) motorboard. The spacers accommodate the lip formed by the deck-hull joint. I bore shallow holes into the motorboard to keep the screw clamps in place – and, yes, I did lose a motor once on a transom that did not have this feature. 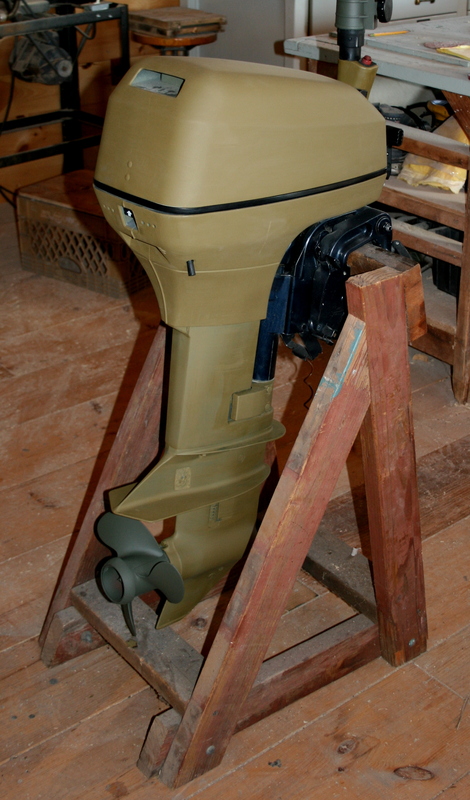 The outboard is a 9.9 Evinrude – circa 1999. 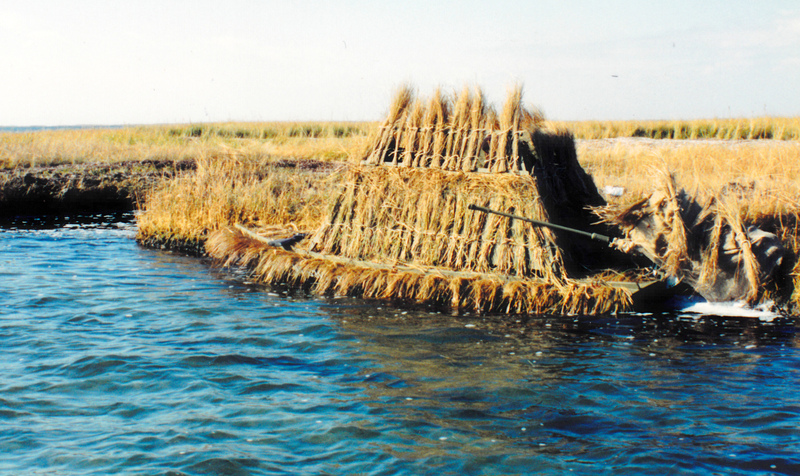 Here is how I gun her – all thatched up with a mix of Salt Hay and Cordgrass. The spray dodger is down, the lap canvas is in place, and the motor cover is on. Note how the pushpole stows in its chock and bail. When I can, I usually try to break up the symmetry of the boat by tossing some wrack – usually Eelgrass – onto the decks. I love this hull. Its round-section, semi-displacement bottom may not be fast, but it is very safe and comfortable in heavy seas. On the other hand, I plan to make a couple of significant changes to the decks. The cockpit is wider and longer than it needs to be and the deck could stand some more crown. These renovations will make the boat safer, easier to hide and give me a bit more underdeck storage. Also, they will give me an opportunity to install floatation all around the boat so she would float level if ever swamped. Another modification is this removable blind. 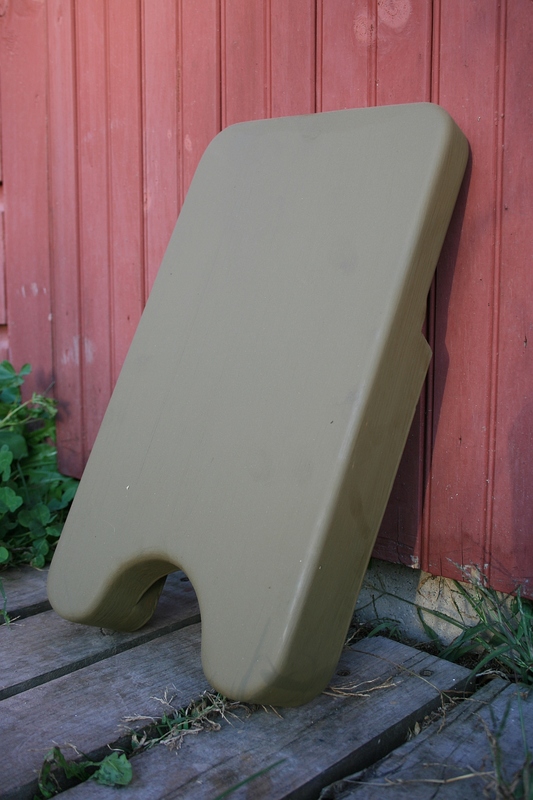 It converts my 1-man lay-on-your-back to a 2-man-sit-on-spackle-buckets-and-shoot-over-the-side rig. 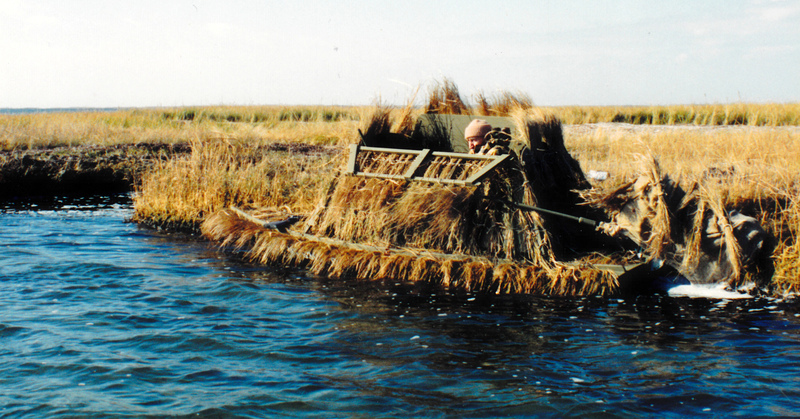 It sits down over the spray dodger and lashes to the thatch rails via 4 cleats on each lower corner of the blind and lengths of parachute cord rove through the thatch rails. It truly takes about 30 seconds to install or remove. Although its windage keeps me off the stormiest bay, it does provide comfortable gunning for 2 gunners – especially my Dad – who was near age 70 when I built it. A little help? 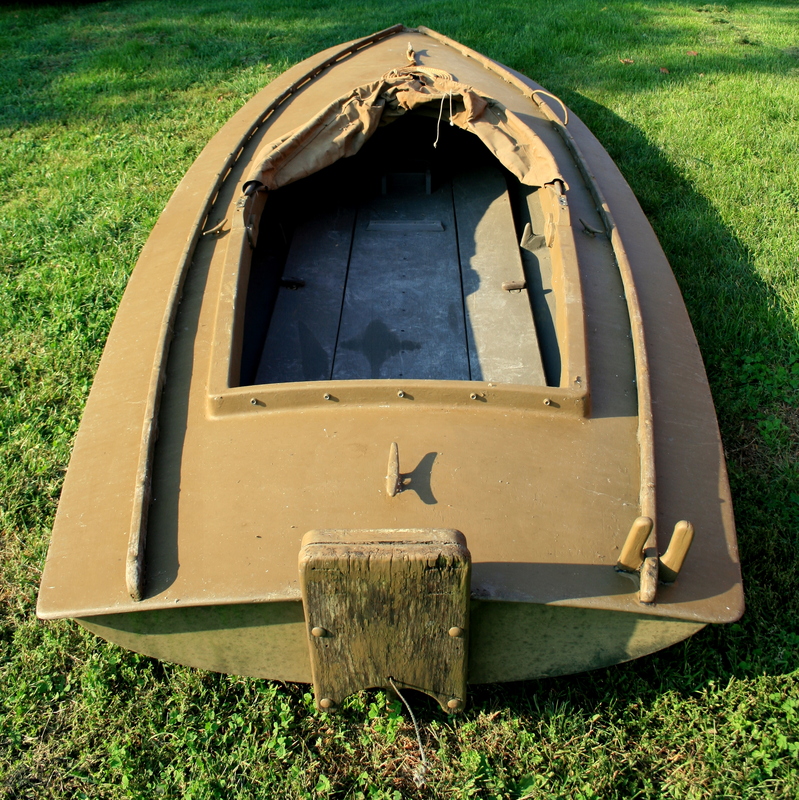 Do you know who might have built this boat originally? Some have guessed that it was built in Jersey – perhaps by a Regan or Reagan? It was probably made in the 1960s or 70s. Frankly, it was not well-crafted. The stringers – 3 lengths of long-since rotted wood – were encased in woven roving but were installed slap-dash. The middle stringer is not exactly on the center line and the side stringers are not equidistant from it. The hull has a distinct twist to starboard up foreward and the foredeck needed a strut for support. 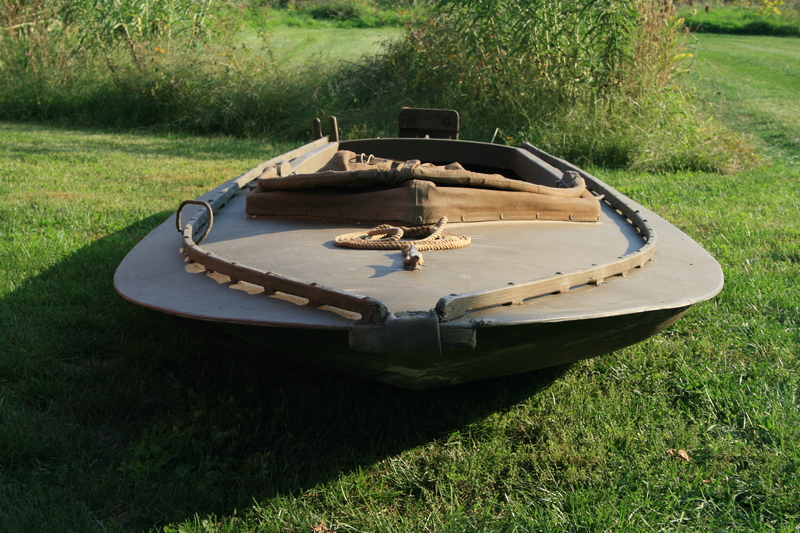 Nevertheless, if you recognize the boat – she’s 13’5″ LOA by 5’0″ beam – please send me a note (see Contact & Sales). What material did you use for the motor board? Recently discovered your site while looking to repair some LL Bean cork goose blocks. If Max has not discovered it in the meantime, the Mystic Seaport Museum has some plans on a Barnegat Bay sneakbox. I moved to my wife’s home of Westport, MA 24 years ago. My duck hunting mentor was a family cousin from this area, who was a NYC doctor who lived & gunned on Shelter Island decades ago. 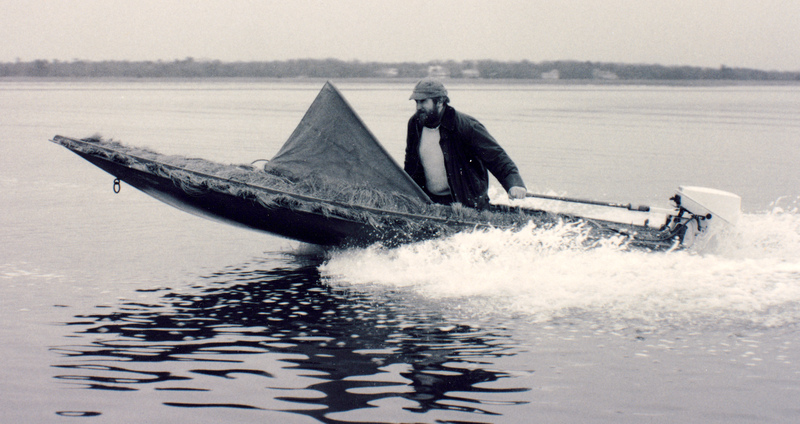 In addition to his medical practice, he was a lifelong outdoorsman, taxidermist, decoy carver & boat builder/sailor. He passed a couple of years ago. I am currently in possession of his one man sneakbox. 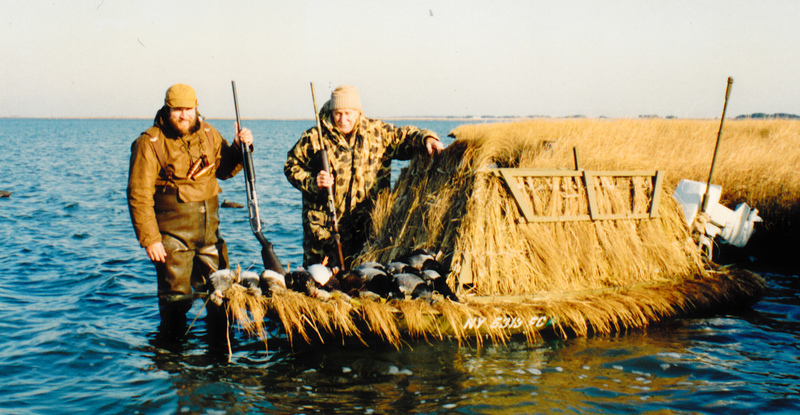 He also had a 2-man version that he taught me how to hunt the salt marshes. Your site has triggered me to try to accomplish some of the things that he did that inspired me. He gifted me a locally produce sailing skiff, circa 1910s, that I got on the water for a season, but I am learning how to actually restore it. I am not a young buck anymore, but my youngest son followed in our footsteps (he is currently on Long Island in the U.S. Merchant Marine Academy), and I would love to be a bridge to pass on traditions of the area that I did not grow up with, but deeply respect. 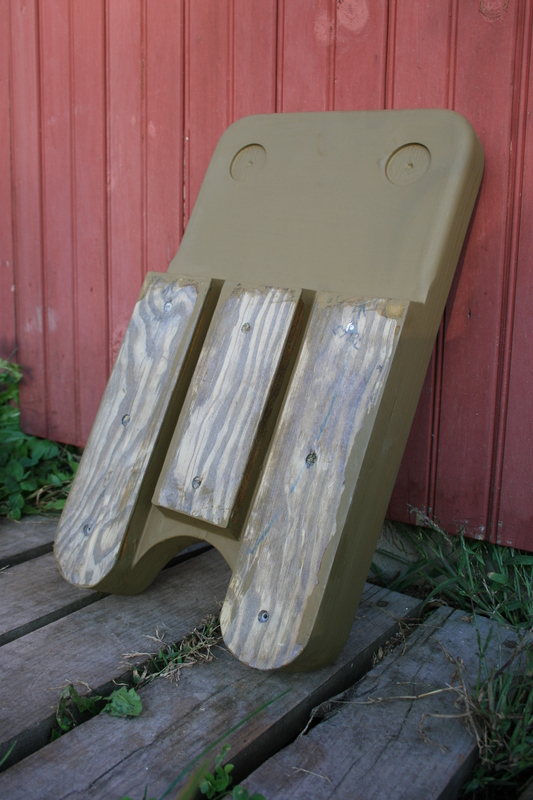 Love your site, and I have some basswood that I am going to try to carve some diver gunners to Cousin Bob’s plans with your tutorials. Thanks a million.